This intuitive, easy-to-use software gives electrical professionals the ability to design an effective, code-compliant lighting control system. Coopersburg, PA (August 15, 2018) – Lutron Electronics, the leader in smart lighting controls and automated shading solutions, announced today the release of Designer+ 11.2, the latest version of Lutron Designer+ software for Vive solutions. 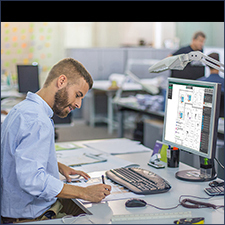 Designer+ is an intuitive, easy-to-use software tool that enables electrical industry professionals to quickly arrive at the right lighting control solution. Users can select the energy code they need to meet and the room types that require control. Designer+ for Vive automatically selects the gear and programming needed, based on a cloud-synced database of the latest code-compliant solutions. From there, each area on the floorplan is stamped with the proper solution, and in just a few clicks a customized bill of materials, sequence of operations, one-line diagram, and even CAD-exportable floorplan is generated, allowing users to effectively communicate design intent and create a professional bid package. The new Designer+ for Vive continues a Lutron tradition of world-class design tools. In April, Lutron launched code-based room type templates, which allow users to simply "stamp" room types on the floorplan to quickly create a code-compliant solution. A May 2018 update added a customizable Dynamic Riser Diagram, enabling users to create everything from detailed risers to simplified room typicals. To download the free Designer+ software, simply visit www.lutron.com/vive.